H.E. Prof. Ahmed Saeed Salman, Vice Chancellor of the University of the Holy Quran and Islamic Sciences, received at his office on Thursday morning, a delegation from the University Security Police General Department headed by Major General Dr. Shazalli Mohamed Saeed, Director of the Department and Brigadier-General Dr. Abd Al-Haleem Obeid Ahmed, lieutenant Mussab Mohamed, and Captain Hussein Ahmed, Director of U of HQIS Branch-Security Police. H.E. Prof. Salman briefed the delegation about the establishment of the University, its mission, goals, branches and its local and international relations focusing on the University's distinguished programs in serving the community. Prof. Salman also appreciated the efforts exerted by the University Security Police in maintaining stability of the educational process. In the same context, H.E. 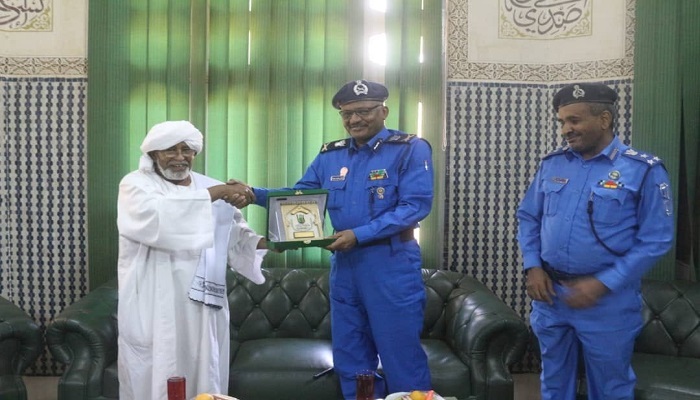 Major General Dr. Shazalli Mohamed Saeed, Director of the University Security Police General Department, expressed his thanks to the University of the Holy Quran, Science and Islamic Sciences as one of the great academic institutions in Sudan where he appreciated the role of the university and its community programs. H.E. Major Dr. Shazalli also stressed the role of University Security Police in maintaining security and stability in all Sudanese universities.